Just three ingredients are needed to make these soft, cake-like balls which have the texture of a cake pop! 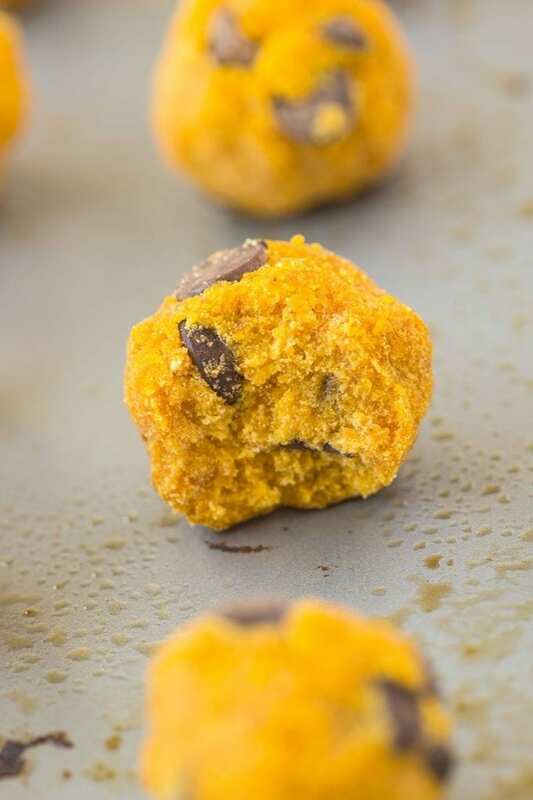 Taking only 10 minutes to whip up, these Pumpkin ‘cake pops’ are paleo, vegan, refined sugar-free and gluten-free! 2 Things before we get into today’s recipe/post/schpeel about food judgement. 1. Don’t forget to enter here for a chance to win an epic pasta kit including a $500 Gift card and a slew of kitchen utensils- Time is running out! 2. I’m still accepting ingredient ideas using one of these options. One will be used for my next recipe and there will be a prize for the reader who recommends the ingredient I end up using! I wasn’t intending on sharing these simple yet delicious pumpkin cake pops until next week, especially since I don’t usually post a slew of recipes in a row. However, after some heart to hearts, brussels sprouts to brussels sprouts and (insert analogy of choice here) with Alexis, I’ve decided to share it sooner than later- With good reason. Since I’ve arrived in Columbus, I’ve had the pain pleasure of hanging out with Alexis on several occasions. Whether it’s chilling at a cafe and working on our respective blogs, going to this ridiculous sized outdoor Mall or just cruising the streets of German Village like Jay-Z and Beyonce- It’s always an epic time and always involves something we both enjoy- Food. Unlike Alexis, I don’t have a dietician certification behind my blog. Sure, I’ve got college majors and a minor in it, but at the end of the day, my degree with my name on it is NOT under the nutrition and dietetic umbrella. However, similar to her, I regularly share a full day of meals on here and preach butter, greens and everything in between. While I often do receive negative feedback or snarky remarks on my meals (“stop eating so much processed foods!”), I usually just brush them off and go back to enjoying my pizza or bowl of broccoli. 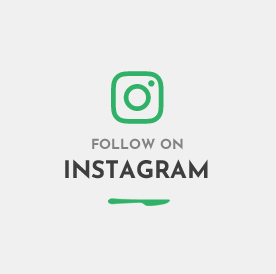 I honestly find Alexis sharing a full day of meals or showcasing her eats to generally be much appreciated and unique- How often do you see certified dietitians share their meals and show you that yes, they are real people too? That is why it’s annoying and ridiculous seeing people under the guise of ‘anonymous’ feel like they have the right to pose judgement or make false accusations of her intake, her choices or her consumption. Having spent time with her, I know for a fact that everything she posts is 100% accurate, which ties in perfectly with today’s recipe- These pumpkin ‘cake pops’. 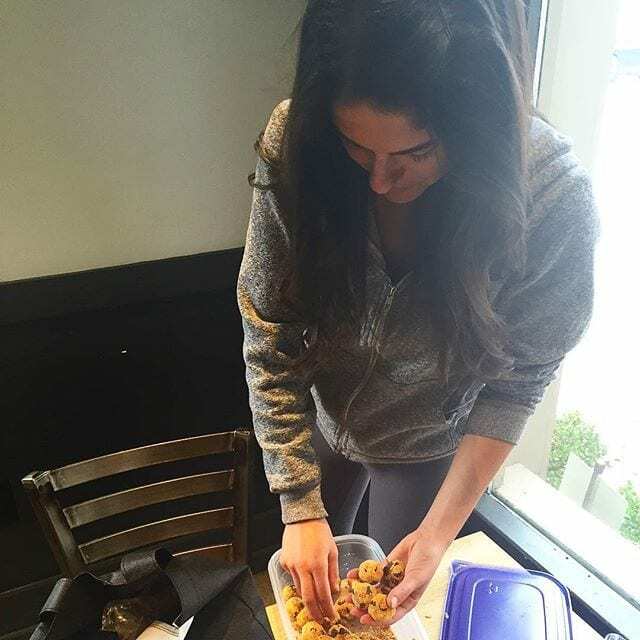 After a morning of baking these cookies and these cake pops, I went to meet her and brought her half of both- I, myself, had eaten the other that morning as a combination of breakfast and lunch. Let’s just say by the time we left her workplace to grab dinner, the box was near empty. Friends, Alexis gave me her seal of approval and she has an epic palette. If these don’t turn out delicious, you can blame her and her sabotaging ways. These healthy three ingredient ‘cake pops’ are soft and cake like and literally take 10 minutes to whip up in your oven! 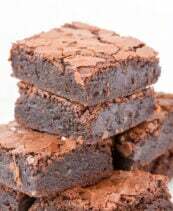 Ironically, they are the EXACT same ingredients as the three ingredient pumpkin ‘fudge’ but baked lightly to give it the delicious ‘cake’ like texture coconut flour naturally possesses. 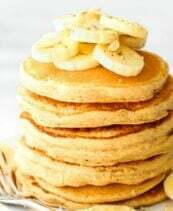 Naturally paleo, vegan and gluten free, these are also refined sugar-free and very low in fat.While coconut flour with a dash of coconut palm sugar is generally pleasantly sweet, go ahead and add some optional chocolate chips to the batter to take it up a notch- I won’t disapprove. Soft + VERY cake-like- Less time. 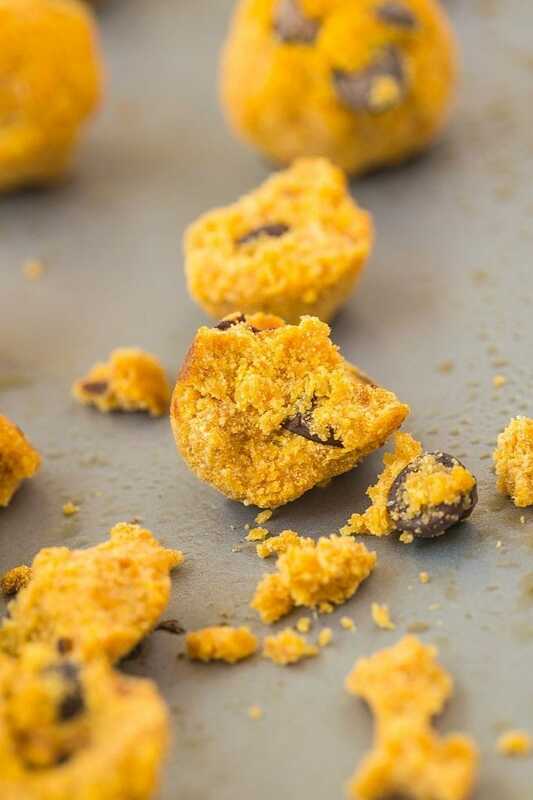 Firm + Crumbly like a loaded cookie- More time. 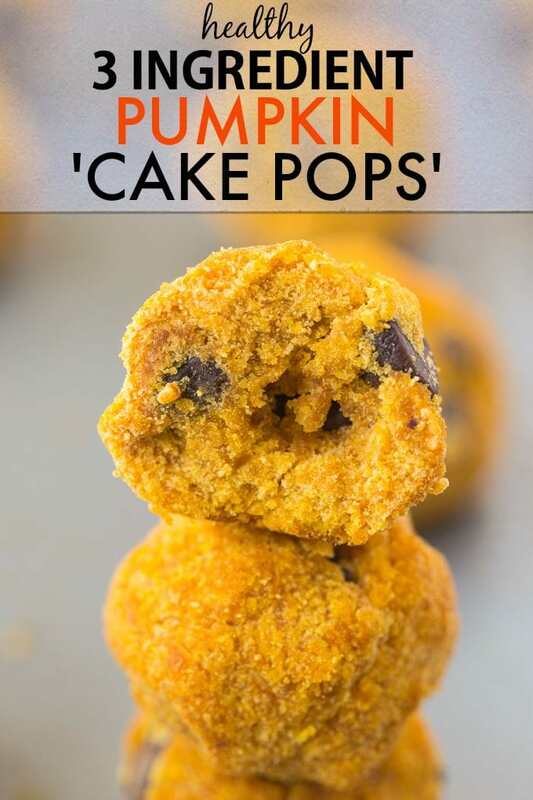 Make these healthy 3 Ingredient Pumpkin ‘cake pops’ and whether you eat 10 meals a day, 10 chickens a day or half a pan of these cake pops- You do you, I do me, and let Alexis have her cake (pop) and eat (12) it too. Just three ingredients are needed to make these soft, cake-like balls which have the texture of a cake pop! 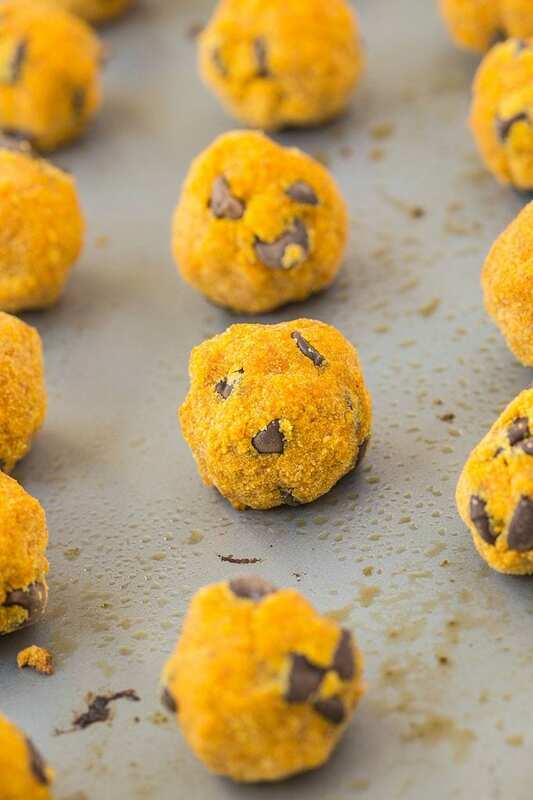 Taking only 10 minutes to whip up, these Pumpkin 'cake pops' are paleo, vegan, refined sugar-free and gluten-free! Preheat the oven to 350 and grease a large cookie sheet or baking tray and set aside. In a large mixing bowl, combine the coconut flour, pumpkin puree, granulated sweetener and cinnamon mix well. If using chocolate chips, mix those in until fully incorporated. Using your hands, shape into small balls and place on the greased cookie sheet. 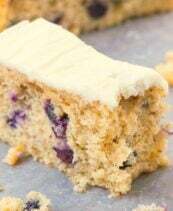 Depending on the texture you want, bake for around 10 minutes (for a softer cake texture) or up to 15 minutes (very dense and crumbly). Remove from oven and allow to cool completely before eating. * Depending on the brand of coconut flour you use, you may need more pumpkin puree. Also, depending on the amount of chocolate chips you add, you may need more pumpkin- Adjust accordingly (batter should be firm yet still relatively soft. ** If you use extra, you'll need to add more pumpkin. Cake pops can be stored at room temperature in a covered container for up to a week or frozen. Do you enjoy seeing a full day of meals by bloggers? Are you ever judged for your choices? These seem easy enough and what a cute idea! I’m still spastic with coconut flour, but I am totally feeling homesick for the states with the lack of pumpkin foods in the UK so I will HAVE to make it on my own! These look amazing! And you can’t go wrong with just 3 ingredients! Right? Thanks so much, Kristy! These look so, well….CAKEY! 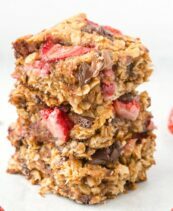 I love the texture that coconut four gives to treats so I am definitely making these! Love how easy they are too! I want to try a bunch of different variations! Right? Please do. OR. Just come here and be my taste tester. Alexis is getting annoying haha! I love having blogging friends in real life to remind you what matters and to keep it real. Glad you and Alexis have each-other. And glad to have this simple recipe! Sounds delish! These look so awesome! Not only healthier but also easier than regular cake pops! Right? Thanks so much, Liz! 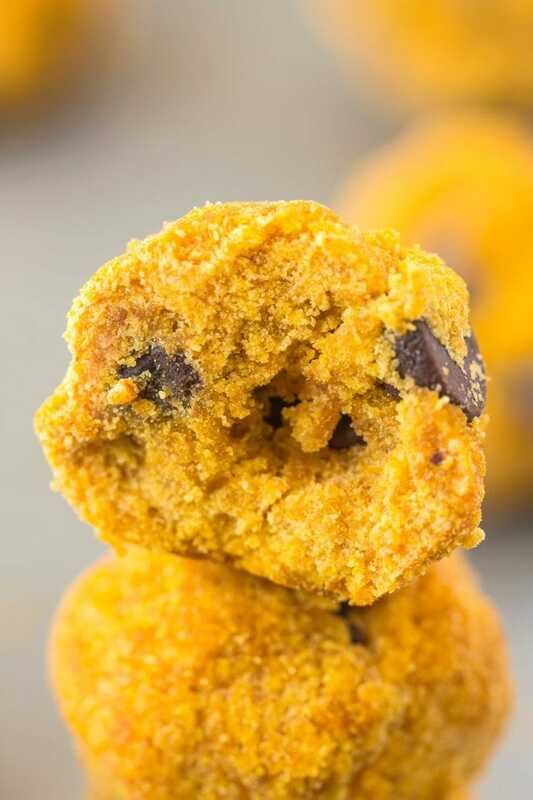 Pumpkin cake balls. What a white girl. Totally kidding— these are genius and I’d like to make them and not share with my college friends. Excuse me, just because I’m white doesn’t mean you need to be lacist. I mean racist. LOL. Sophomore spread sounds so dirty! I love these pops! They look SO much better than regular cake pops. I tried making them once and it was an epic disaster of cake bits everywhere. Oooh, the fudge looked good, but I think I like these even better. I’m sure people judge me. I mean, I use canned pasta sauce, for goodness sake. The horror!! LOL. Luckily, most people have the good sense to keep their judgement to themselves, because obviously I don’t give a crap. How dare you not slow roasted tomatoes for 23 hours then consume it. I’ve never been much into posting the whole “here’s what I ate today” thing. I know a lot of people do, and a lot of people can make that kinda funny…but it’s just not my cup of tea. (No, I am not drinking a cup of tea right now!) But I do wish I was eating these cake pops. I only wish they had 4-ingredients. I’m not sure what the 4th would be…I just like the number 4. Haha…just kidding! Well done, mate!! I love this post and it’s great that you and Alexis have each other. I am often judged by what I eat or what I give my kids because I am a Nutritionist, people think we all just eat vegetables and fruit 🙂 Balance is so important and people need to stop judging! Oh and these pumpkin cake pops? My new favorite. I can’t wait to make them! Shall i make these this weekend? I kinda think i shall 😉 And i even like that they’re not on a stick because who has time to put them on a stick.. just saying. I love it when bloggers show a full day of eats! I used to be brutally comparative a while back.. but then again it often inspired me to realize people that were dietitians and health coaches were still “indulging” and being real people. 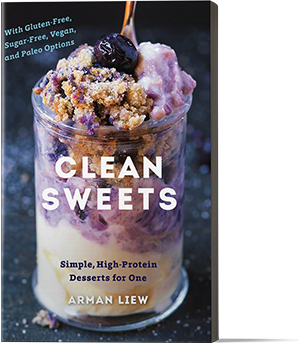 For me now, I think the full day of eats is an awesome place to find new ideas and change up meal routines that we can get sucked into. P.S. (L) (pumpkin spice latte if you werent catching on) i <33 all of your pumpkin BYE. Mmm I can dig it! By the way, I crumbled your pumpkin fudge over some vanilla ice cream the other night and it was too good! Today I am having it over Greek yogurt for a healthier version of that dessert. These look amazing. So much pumpkin! Yesssss. You could stack these and make pumpkin snow people if you strategically place the chocolate chips. 🙂 Or jack-o-lantern snow people for Halloween. 🙂 They look great, Arman. 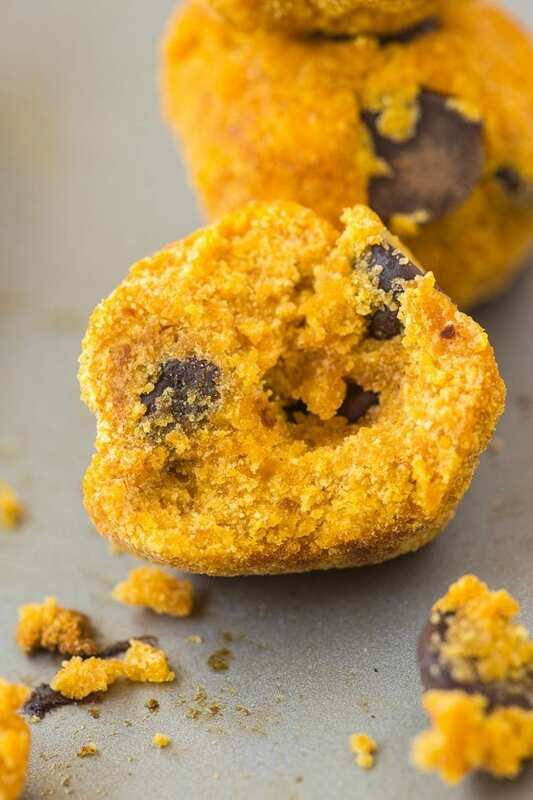 I really need to get some coconut flour so I can try these. I think when you’re in the business of talking about what you eat on a regular basis, you’re probably going to get judged regularly. All you can do is just ignore it, really – you know what you need and what you like to eat. Not jumping on the pumpkin bandwagon yet, buuuut I’m sure it’s coming. You shall stop eating now you’ve finished training. Grass on toast. You had me a three ingredients and pumpkin. And no complaints from me! Go forth and bring on allllll the pumpkin recipes. 😀 coming just for you! These look AMAZING. I happen to have everything on hand. Coincidence? I think not. Off to bake! Can I be the taste tester next time puhhhhhhlease? Thanks. Also, food judgers should just stop–I can’t deal. Food judgement is not cool. We are all different, with different appetites and needs. These cake pops, however look very cool. Oh no way! I love German Village- So many good dining options! I’ve been reading your blog for about 6 months now (love it!) and after today’s post, I understand why. I enjoy it so much: A) You’re friends with a RD (I’m a RD, LDN) and B) I love, love love pumpkin!!! Seriously, your recipes are delicious and simple. I have suggested your blog to quite a few of my patients and have even food demo’d one for an example of a healthy recipe. I appreciate that you understand that RDs eat real food (we may just practice balance a bit more that the average person). You should plan on going to FNCE with Alexis (if she’s going) and meet a ton of RDs!! Keep up the great blogging; I appreciate it! 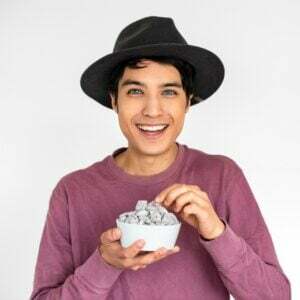 It’s weird, or not, I don’t ever get food judgment in my WIAW posts or any other really. Or maybe I do and it just goes right over my head. I suspect the former though. Maybe it’s a sign you guys have made IT, whatever that really is. Haha I will judge you moving forward! I LOVE Pumpkin and I LOVE EASY recipes, so this is a MUST TRY for me! I love these pumpkin cake pops, and not time-consuming to make! I’m so pleasantly surprised that with so few ingredients you can doctor up something so cake-y and yummy-looking. Okay, are you hinting at something with all of these coconut flour recipes? 😛 JK. Hahahaha come over and I’ll make you a coconut flour castle. Love these pops. They look perfect! Pingback: Creamy one pot pumpkin curry rice + Giveaway! I’m diggin all the pumpkin to soak balance out the super absorbent coconut flour. These sound like a really nice treat. My mom has one of those cake pop makers. I bet if I put these on a stick my little guy would go mental for them. Is it cool with you if I include a link to these in my fall inspiration round up post? I LOVE seeing full days of meals by bloggers–it’s one of my favorite types of posts to see–and also YouTube videos! And as for food judgment, you have NOOOOOOOOO idea! I’ve been judged for zoats, mixing curries together, eating sweet potatoes with peanut butter and more! I am the QUEEN when it comes to being judged for food! Haha I think many can relate to being judged! Is there a reason you opt for just cinnamon instead of pumpkin pie spice? Just curious! Also, do you think almond flour would substitute well for the coconut flour? Can’t wait to try this! Hey Lauren! You’re more than welcome to use pumpkin pie spice- I sometimes find nutmeg/cloves to be overwhelming with coconut flour, but it’s a personal preference. I don’t have a granulated sweetener, but I do have honey. Could I use that instead?